OK. Have to confess I've been pre-occupied lately and although I've been quilting, haven't had the brain power to write about it. So no quilt talk today. Sorry. Mom had it last year. Cousin Beth battled it 3 years ago. Cousin Toni - 5 years ago. Now it's my turn. This is a club I never wanted to join. I have to admit that it's scary. Sometimes it overwhelms me. But, as wiser people than I have said: "Cancer is a word, not a sentence." It looks awful. Really awful. I've got a metal thimble for my middle finger on my right (dominant) hand and I use that to push the needle through - but I keep pushing with my thumb, too, and it's unprotected. It's a little bit sore, too. I guess eventually my thumb will form a nice callous - but that probably won't look much better. I got the cream background fabric last January from Spotlight's clearance table. Something like $6 a meter - who could resist? 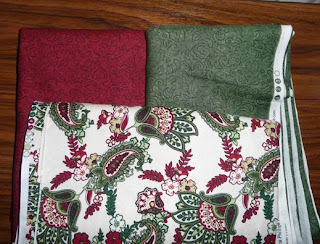 The red and green fabrics came from "Patchwork With Gail B" and cost more, but certainly are worth the expense. As you see, I'm going to try my hand at a lattice "on point" - but... I'm not actually doing those center blocks on the bias. No - they'll be cut with the grain, thus saving a lot of aggravation that comes from stitching on the bias (just about impossible not to stretch things out when piecing by machine). 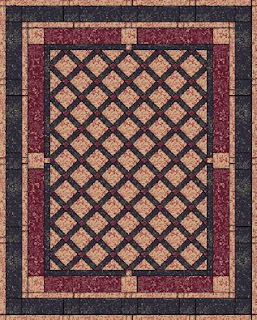 I used "Quilt Design Wizard" computer software for the design but I know there is a "glitch" in the yardage calculations... so I did a second design for the middle lattice section using just plain blocks (not on point) so my yardage for the lattice isn't ridiculous. Fingers crossed and away I go! My friend Pauline is a quilting genius! She helped me select the colours for what will be my 4th project (a Christmas quilt). When we were at the store we looked and looked until my eyes were just wearing out. It was really hard to check the reds and greens - until Pauline told me about her little trick. I was trying to find a match for the darkest green (the "number 2" colour dot). It was very hard to do from the design because the dark green on the print is so small. But the colour dot was a good size. It's a lot easier to match using those dots than trying to match the colours in the center of the fabric's design. Slowing Down Now - Priorities! 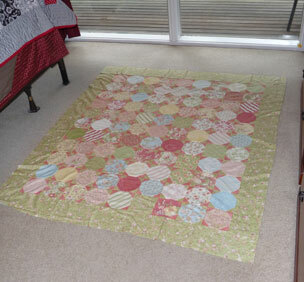 Here it is - the completed quilt top (plus border). 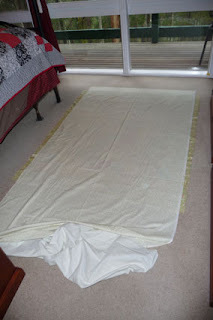 I've spread it out on the floor so that I can lay the backing fabric over it to see if the backing is wide enough. 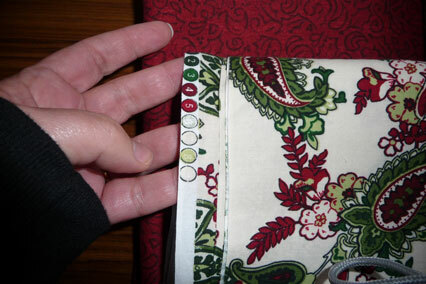 For tihs quilt I've chosen a printed calico as the backing (below) - cream and mossy green. In the photo below I've spread the backing over the quilt top. As you can see on either side, the backing isn't quite wide enough. 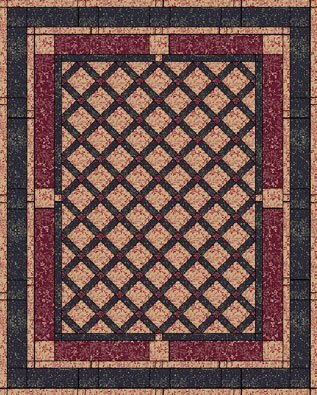 I'll have to add 3 inches to each side, and will do that by cutting from the excess backing material at the bottom. This one is small enough to squeeze into my suitcase when we go to visit Aunt Sheila. Have small quilt; can travel.